This simple weeknight dessert is delicious hot or cold. Heat the oven to 220c, gas mark 7. Arrange the plums in the base of a gratin dish to make a tight fitting single layer. 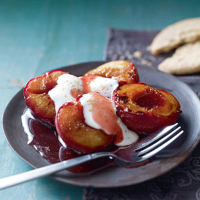 Mix together the brown sugar and cinnamon and sprinkle over the plums. Bake for 20–25 minutes until tender and golden. Spoon the soured cream over the top and sprinkle with the demerara sugar. For a crunchier sugar topping, you could place the dish under a hot grill until the sugar melts, but it’s not essential. Serve with shortbread biscuits. Find a good deal in our French Wine Showcase: try a fruity fizz here, such as the Cave de Lugny Blanc de Blancs NV Crémant de Bourgogne, France.